DALLAS - The parent of American Airlines wants to eliminate about 13,000 jobs - 15 percent of its workforce - as the nation's third-biggest airline remakes itself under bankruptcy protection. The company aims to cut labor costs by 20 percent under bankruptcy protection, and will soon begin negotiations with its three major unions. Some management jobs would also be cut. AMR also proposes to end its traditional pension plans. The move has been strongly opposed by the airline's unions and the U.S. pension-insurance agency. AMR Corp. CEO Thomas W. Horton said Wednesday that the company hopes to return to profitability by cutting spending by more than $2 billion per year and raising revenue by $1 billion per year. AMR lost $884 million in the first nine months of 2011, and on Tuesday it disclosed a $904 million loss for December alone. It has lost more than $11 billion since 2001. "We are going to use the restructuring process to make the necessary changes to meet our challenges head-on and capitalize fully on the solid foundation we've put in place," Horton said in a letter to employees. Employees have braced for bad news for weeks. AMR, American and short-haul affiliate American Eagle filed for bankruptcy protection in November. Horton said in December that the company would emerge from bankruptcy with fewer workers. "I expect dismay and outrage from our membership as details of the proposal are made public," said Laura Glading, president of the flight attendants' union. Horton said cost-cutting moves will include restructuring debt and aircraft leases, grounding older planes, and changing labor contracts. Horton and other top executives outlined the job cuts and other proposals during a closed-door meeting with employees near the company's Fort Worth headquarters. The company has about 88,000 workers. Most are represented by a union. The biggest cuts would come from the ranks of maintenance workers, about 4,600, and baggage handlers, about 4,200, according to company spokesman Bruce Hicks. About 2,300 flight attendants, 1,400 management employees and 400 pilots would lose their jobs under the plan, he said. If American and its three unions can't agree on labor cuts, the company could ask a bankruptcy judge in New York to impose changes on workers. But federal law requires the company to make a good-faith effort to first negotiate agreements with its workers. Ray Neidl, an analyst with Maxim Group LLC, said for American to win support for its plan, it would have to offer employees a goal - a carrot - and not just a stick. "It's hard to see a carrot right now," he said, "but you have to convince them that this is part of a plan to return to profits and secure jobs." The company also wants union approval to drop its traditional pension plans, which cover 130,000 employees and retirees. It would replace them with 401(k)-type plans under which the company contributes to workers' retirement accounts. The pension plans were once standard in the airline industry. AMR's are underfunded by billions of dollars and the company said on a new website Wednesday that it could no longer afford them. This week, the U.S. Pension Benefit Guaranty Corp. slapped liens on $91 million in AMR property after the company paid only $6.5 million of a required $100 million contribution to the plans. PBGC Director Joshua Gotbaum said that before American "takes such a drastic action as killing the pension plans of 130,000 employees and retirees, it needs to show there is no better alternative." He said the company had failed to provide even basic financial details. Company officials were scheduled to meet separately on Wednesday afternoon with the Allied Pilots Association, the Association of Professional Flight Attendants and the Transport Workers Union. Besides spending cuts, Horton said AMR plans to ground older planes and go ahead with orders to buy hundreds of new aircraft. That would cut fuel use - high fuel costs have been a major drag on American and other airlines. The bankruptcy judge hasn't approved those new orders, but he has allowed the company to take delivery of some new jets. 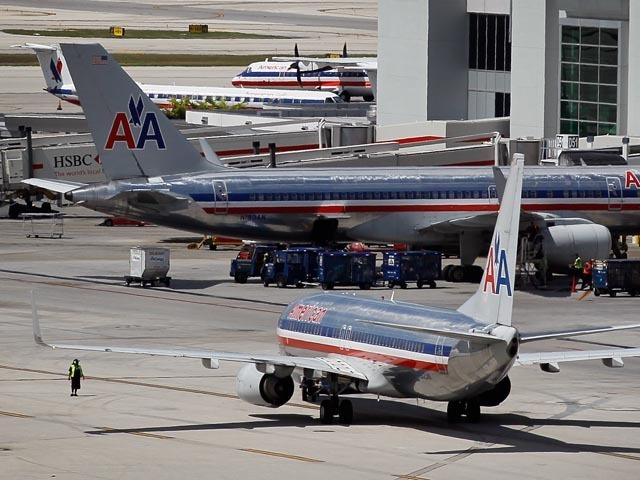 To increase revenue, American plans to increase flights in New York, Los Angeles, Chicago, Dallas and Miami by 20 percent over the next five years, Horton said. AMR is the latest of several large U.S. airlines to go through bankruptcy in an effort to reduce costs and debt - United, Delta and US Airways in the past decade, and Continental - now part of United - in the 1990s.